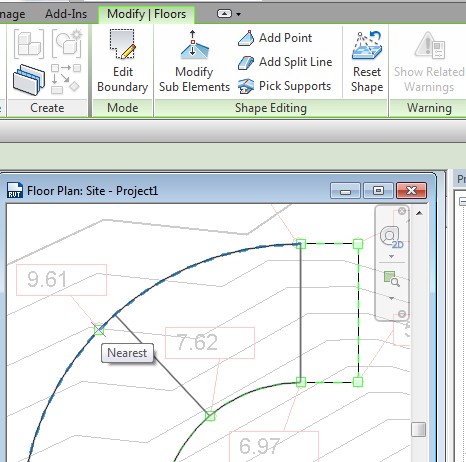 As discussed in Part 1, Floors are one of the better options for creating hardscape in Revit, especially when using the Modify Sub Elements tool. 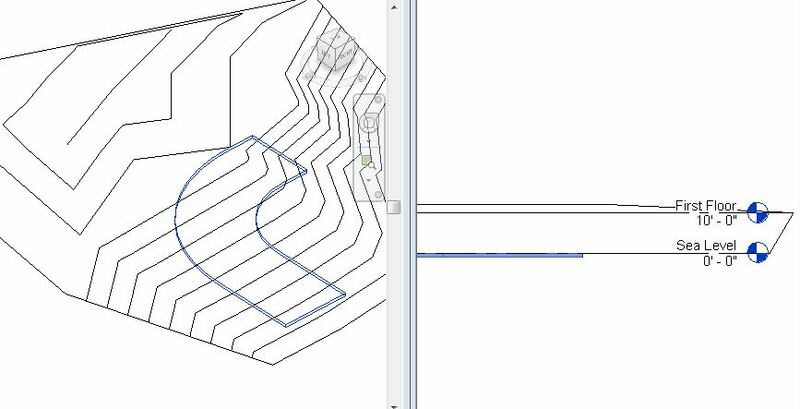 This is often the best method when creating hardscapes with new grading/ spot elevations (there is a different workflow for re-create an existing hardscape area). So, starting out, I have a (flat) floor, drawn at Sea Level. I also have a Topo here, just for reference. Based on the Topo, I came up with some quick spot elevation for this hardscape. With Modify Sub Elements active, all the existing points and edges will turn neon green. Use the cursor to draw a selection box over each point, or simply click, to select each point (I find the selection box to be easier). Enter the desired spot elevation (this can be done in the green modify bar at the top of the screen, or at the blue point modifier directly next to the point). As you modify the hardscape, you will get a Floor Thickness error. It will not apply once the hardscape is done, and can be ignored. If you need to add any points simply add them. 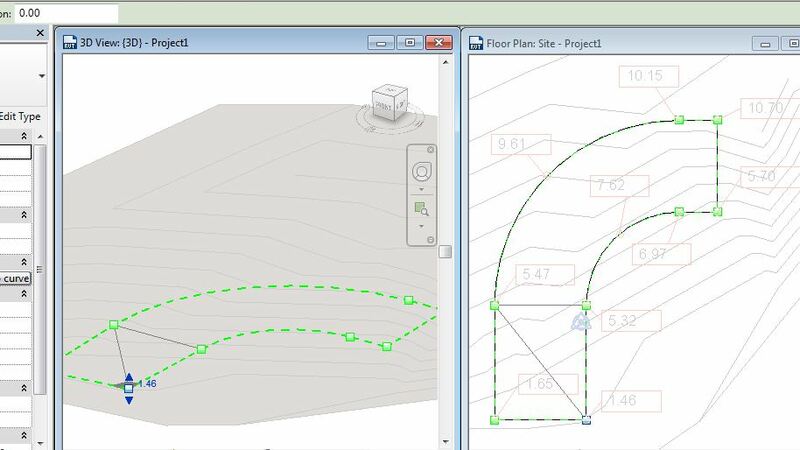 Revit will actually interpolate the height of these new points, based on the height of nearby points. Once you’ve finished re-grading the hardscape, it should look something like this. This is a good time to turn off Interior Edges of Floors in all of your Views and View Templates, if you haven’t already. Now the last issue to deal with is the hatch pattern. If your floor doesn’t have a hatch pattern, apply a material that does (I’ve done a paver here). Revit obviously does not know how to drape a material over a hardscape floor, so this is the result. It does try and guess which way the material should orient on each triangle, but it guesses wrong most of the time. This is less of an issue with a randomly repeating pattern like concrete. So, unless you need the hatch pattern (like with pavers) I would suggest using solid colors, random patterns, or no patterns. But if you are using a model pattern for pavers, they can be reoriented, just like any model pattern. Simply select the pattern and move/ rotate as necessary. This is obviously less than ideal, but not terrible, as it offers much more control than a Subregion. 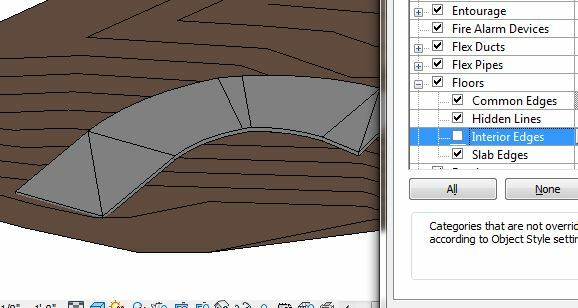 I am surprised that Revit even wraps the pattern around the curve. It wraps the pattern around the curve, but distorts it… This is only useful as a visual trick, because it’s completely misleading if you’re trying to show a paver setout. Thanks for the tip on interior edges – missed that one! Yes, that’s true, it is a distortion. But sometimes you want the pavers to wrap the curve, though other times you do not. Either way, it’s odd that it does this.